My sister-in-law and I recently hosted a baby shower for a good friend who is a HUGE Detroit Tigers fan. She and her husband travel to see the Tigers play several times a summer and the baby boy’s room is even decorated with a large baseball mural, so this seemed to fit them perfectly! We started with a navy and orange color scheme, incorporating orange Gerbera Daises, which coincidentally were the mom-to-be’s favorite flower (love it when that happens!) and baseball themed accessories. For the centerpieces, I stacked two vases on top of one another, attached them together with sticky putty and covered up the seam with wide ribbon. I added custom circles to each side of the vases for an extra pop. Just the top vase held water and the daisies, allowing the baseballs to stay dry. The Cracker Jacks served as favors. I added blue and orange bunting on the tables and over the food. These were SO easy to make with coordinating scrapbook paper. 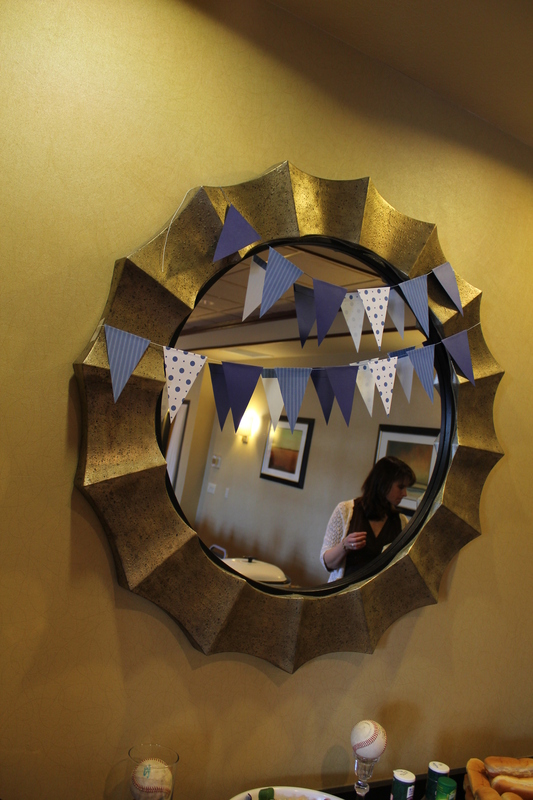 A very effective and inexpensive way to decorate! 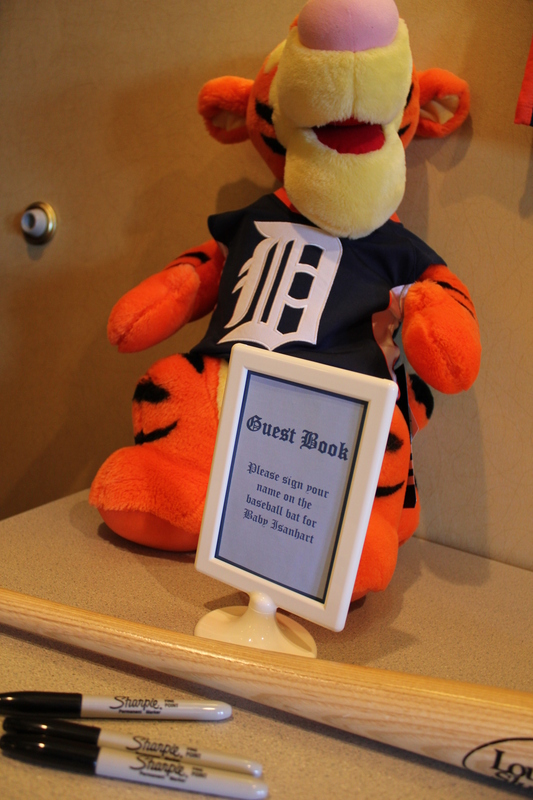 Tigger joined the shower as an honorary Detroit Tiger! Instead of a standard guest book, we had guests sign a baseball bat for the baby’s room. 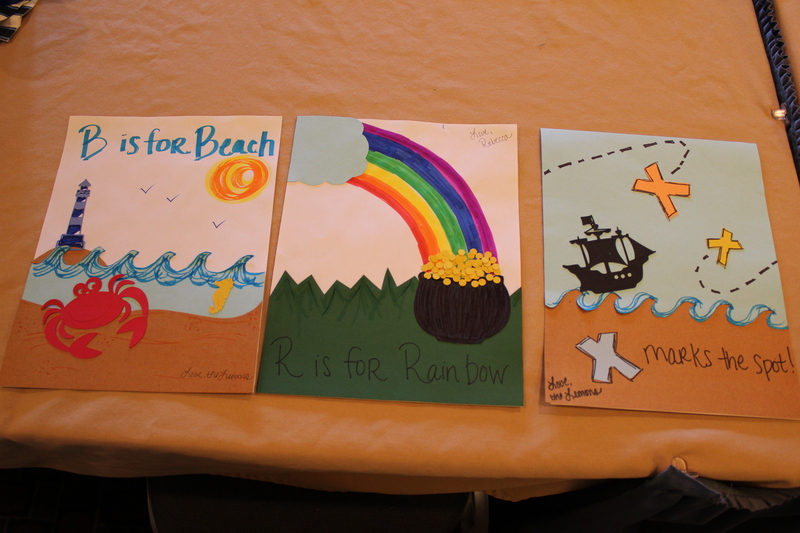 I LOVED the activity we chose to do – baby’s first alphabet book! My SIL is very into scrapbooking, so she brought along a bunch of her supplies and we each made a letter page (okay, I definitely made more than one, but who’s counting?!?). These will be laminated and bound for a memorable book. Overall, the shower was a huge success! Looking forward to meeting Baby any day now! 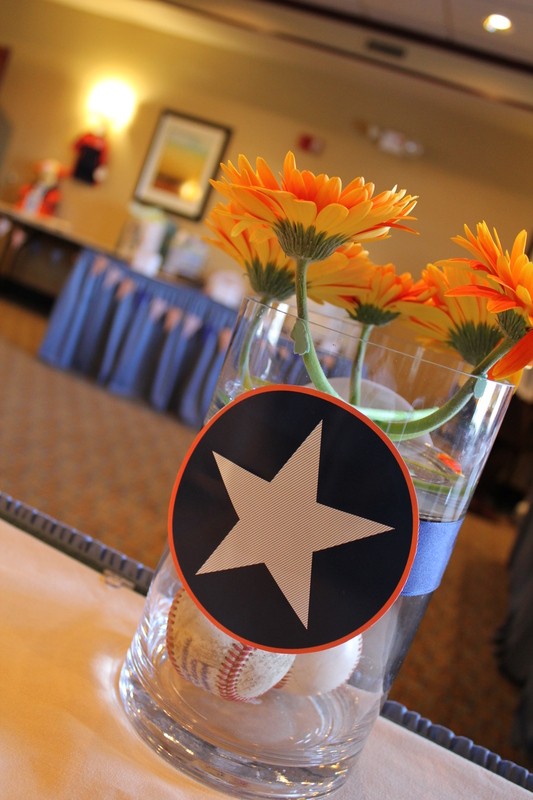 This entry was posted in Event Portfolio and tagged baby shower, baseball, blue, orange. Bookmark the permalink. I was totally wondering if it was a good idea to soak baseballs in water for hours until I realized you didn’t… :-) I also love the baseball bat idea. I once had a baseball with a Bill Buckner autograph on it, until my friend decided he should also sign it. Maybe it would be a good idea for Mom to get a display case for the bat in a couple years… I think they are about $25.00 online. Wow- love this whole theme…very creative. Thanks for sharing! Wow Sue Lou!! These pictures are phenomenal! Must be all that work with Kathy & Dee prepped you for this:] Seriously am SO impressed with you. AND jealous that you didn’t do MY baby shower! I want one of those super cute homemade alphabet books! The color of gebera flowers is really nice. It’s like an happy color. My next party will most likely be a pig roast. We used to host this event every few years…..it’s been awhile.